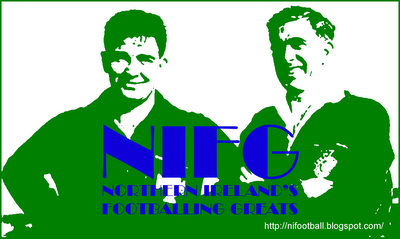 Representative Honours: Ireland: 25 Full Caps (1903-1913); Irish League: 3 Caps (1903-1904). Club Honours: (with Linfield) Irish League Champion 1901/02, 1903/04; Irish Cup Winner 1901/02, 1903/04; City Cup Winner 1901/02, 1092/03/1903/04; Charity Cup Winner 1902/03, Runner-Up 1901/02; County Antrim Shield Winner 1903/04, Runner-Up 1902/03; (with Everton) FA Cup Winner 1905/06, Runner-Up 1906/07. Elder brother of the legendary Elisha, "Peerless" Billy Scott also stands out as one of the outstanding 'keepers in the history of Irish football. Having started his career as an amateur with Cliftonville, Scott went on to win Inter-League and International caps after moving to Linfield. After making his Blues debut in an Irish league match with Distillery on the 31 August 1931, Scott was ever-present over three seasons aside from missing a single Co. Antrim Shield tie in January 1903 through injury. In his second international outing in March 1903 Scott was part of the Irish team that defeated Scotland for the first time. After a jittery start to the match he put in a performance which combined luck and fine judgement to keep a clean-sheet in a 2-0 win. He remained Ireland’s regular custodian for a decade in which time another win over Scotland and a first win over England were recorded. During his 25 cap international career he was also given the honour of captaining his country on a number of occasions. Signed by Everton in the close-season of 1904, Scott had a difficult first season at Goodison, conceding seventeen goals in the first twelve games before being replaced in November by Welsh international, Leigh Roose. The pair went on to share goalkeeping responsibilities for much of the rest of the season as Everton finished as League runners-up, a single point behind Newcastle. The following season saw Scott make the 'keeper's jersey his own, as Everton won the FA Cup Final, 1-0 against Newcastle at Crystal Palace. 1906/07 saw Scott play in the FA Cup Final again, this time Everton lost out 2-1 to Sheffield Wednesday. 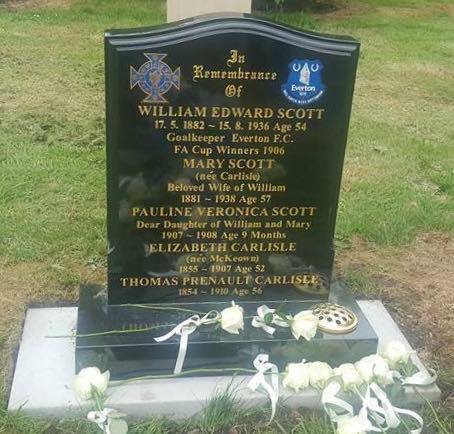 Those proved to be Scott's only honours in English football, though Everton did finish as League runners-up on a further two occassions during his spell with the club, in 1908/09 and 1911/12. Noted for his safe hands and reliability between the posts, when Scott left Everon he proved an exceptionally difficult man to replace. In June 1912 Scott was signed by Herbert Chapman for Leeds City who were attempting to build a team to escape the Second Division. It was a move that became shrouded in controversy as Chapman agreed to pay Scott a full years salary of £208 to April 1913, essentially two months extra wages, and well above the permitted £4 per week. Leeds were fined and the player instructed to return the excess payments. This was just the tip of the iceberg as further financial irregularities led to the club being expelled from the Football League in 1919. 1913/14 turned out to be Billy Scott's final season in the Football League, as Leeds once again failed to make it out of Division Two. They finished in fourth place, just two points behind Bradford Park Avenue, who were promoted as runners-up, but with a far superior goal difference. One of the most damaging results came on 2nd March with a match away to Clapton Orient which kicked-off at 4:30pm. In those pre-floodlit days it was inevitable that the game would finish in semi-darkness, and Scott claimed that he was unable to see the last two goals scored against him in a 3-1 defeat. Leeds City appealed to the Football League to have the game replayed, without success. 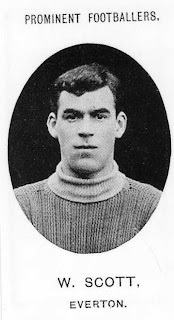 During the First World War Scott was on the books at Liverpool but he never appeared in a competitive fixture. At the time Leeds City folded in 1919 he was at Anfield on a loan basis as reserve team 'keeper. He remained in Liverpool, working in the licensed trade, and died of pneumonia at a relatively young age and is buried at Anfield Cemetery. For all his own achievements, Billy's biggest contribution to football had to be bringing the young Elisha to Merseyside for trials with Everton and then Liverpool, and setting him on the road to "legend" status. Another goalkeeping brother was John, also briefly on the books at Anfield. Summary: 25/0. Won 6, Drew 3, Lost 16. Trophy and additional details by George Glass. Thanks also to Liz Hargreaves, Billy's niece, who provided family details and the Prominent Footballers card scan and to Roy Cathcart who provided the colour card scan. Burial details supplied by Paul Wharton and early club details by Martin O'Connor. Always seems to be in the shadow of his brother and never mentioned in the same bracket as (Northern) Ireland's greatest ever goalkeepers.